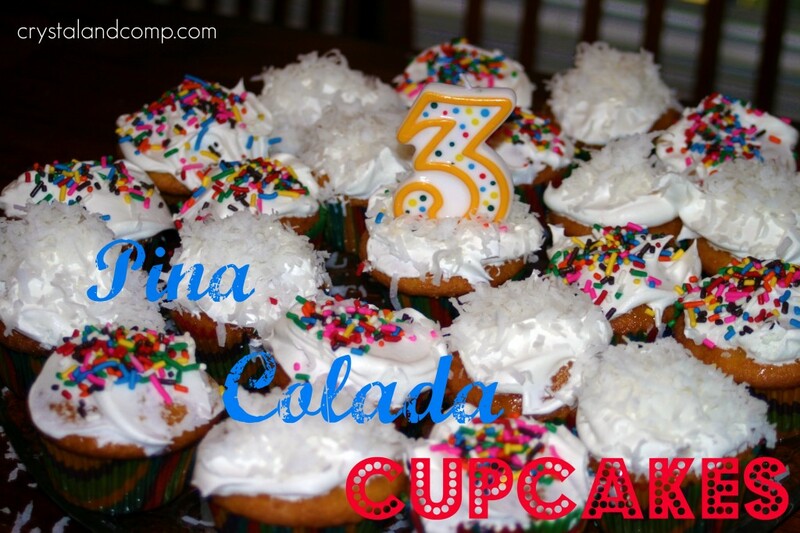 Here is a fun variation of the Pina Colada Cake recipe I shared with you last month. A few weeks back one of my sister-in-laws wondered if the cake could be converted into cupcakes for my nephews birthday party. I did not see why not. Sounded easy enough. So, she followed the steps in this recipe tutorial, except she used muffin cups instead of the traditional cake pan. I imagine this required more toothpick poking, but it was worth it. The results were divine and this is certainly a successful variation! These were such a hit- give it a try. I am sharing this recipe tip on these resourceful sites: i heart naptime, the girl creative, C.R.A.F.T. craftomatic, crafts keep me sane, skip to my lou, making the world cuter, sumos sweet stuff, mad in crafts, tip junkie, tasty tuesday, tempt my tummy tuesday, craft edition, hope studios, todays creative blog, sew much ado, someday crafts, we are that family, blue cricket designs, somewhat simple, paisley passions, house of hepworths, fun to craft, fingerprints on the fridge, tidy mom, a few of my favorite things and it’s a hodge podge life. Looking for a more copious list? Here are over 50 sites to search for and share projects and tutorials. Thanks for liking up at Freestyle Friday! Everything looks delicious… but especially these!! Yum!! Mmmm! Sounds yummy! I made a pina colada trifle once out of a failed coconut cake…totally makes me think of a vacation in Mexico…aaahhhh!!!! I am in the DFW area. Small world, hua? Indeed! I’m less than a year into my blog, so I’m very happy to “meet” other DFW bloggers. Thrilled, almost bouncing. Yes, I’m easily entertained. I love these little cupcakes, lucky 3 year old! That is a great Pina Colada cake recipe. Thank you so much for sharing with Full Plate Thursday and hope to see you again real soon. Hope you are having a great week!